The current Montal site is most likely the site known as “Repaire Saint-Pierre” during the Middle Ages. The name Montal, named after an area of the Cantal region belonging to the lords of Laroquebrou, only appeared in the second quarter of the 16th century with the presence of Jeanne de Balsac, the wife of Amaury de Montal, lord of Laroquebrou. Jeanne was the daughter of the ambitious Robert de Balsac, seneschal of Agenais, expert in the art of war, and Antoinette de Castelnau de Bretenoux. 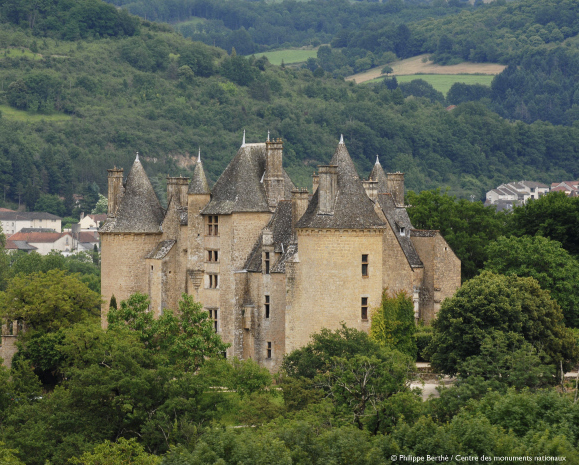 She therefore had strong ties with the Quercy region, where there had been a long history of the Cantal nobles. the same year in which work began on the much grander château of Chambord. Construction commenced on Jeanne’s commission in 1520. The building was never completed, and only two of the intended four wings were finished in 1534. Although legend has it that the work was suspended following the death of Robert de Montal, Jeanne’s eldest son, the real reason for the incomplete property is unknown. The décor of Montal bears testament to the loss of the beloved son in 1523, during a campaign by the French army in Milan. Yet Jeanne remained determined to combat adversity and ploughed forward with her project, ensuring that the Montal line would continue through the marriage of her second son, Dordet, to his cousin Catherine de Castelnau. The new château replaced a previous building, the only remaining evidence of which is a window on the corner of the north-western façade and the western tower. The sober northern façades reflect a mediaeval tradition, accentuated by the presence of three corner pepperpot towers, with cannon ports in the lower section. However, many of the property’s features reflect the style of the 1515-1520 period, including the regularly spaced mullioned windows, and tower cornices with decorative corbels that feature the same motifs visible on one of the towers at the château of Assier. The result is therefore a resolutely austere and highly symbolic lord’s château with high ceilings. There is a marked contrast with the interior courtyard, with its layout characteristic of the First Renaissance and its draughtboard pattern. The floors are separated by mouldings, a vast horizontal frieze and a shell-style cornice, with regularly spaced pilasters that reflect the tall, sculpted skylights. The two dwellings, at right angles to one another, are served by a grand staircase in a rectangular pavilion, which leads to a high hall. Unlike the separate, spiral staircase model, the straight staircase at Montal, with its modern styling, is famous for the decorative, sculpted backs of its steps. The ornamental styling continues on the first floor, commencing with geometric and heraldic motifs, followed by a decorative repertoire featuring putti, war trophies, battling birds and dolphins, antique-style profiles and allegories of Fortitude. Jeanne de Balsac also makes her dominance known in a sculpted medallion portrait and repeated inscriptions of her initials. The outdoor sculptures also make Montal a truly unique château. The decorative detailing on the frieze between the ground floor and the first floor features mythological and allegorical figures (Hermes riding a unicorn, Hercules and Antaeus, Mars and Victory), cherubs, fantastical figures and beasts, coats of arms and initials of Jeanne and her sons Robert and Dordet, and foliated scroll motifs). The piano nobile features an entirely different decorative style, with a series of high relief busts on the blind walls between the mullioned windows, along with statues of the Cardinal virtues (Fortitude and probably Prudence). Each bust is accompanied by a triangular pediment with figures, fantastical beasts or scrolls. The seven portraits depict Jeanne and her loved ones, parents, husband and eldest son, who perished during the construction. Only Dordet, her youngest son, and Jeanne’s nephew, the Abbot of Vézelay, were still alive when the property was completed. This funereal monument therefore honours both the living and the dead. It is a theme intricately connected with the decorative design, where the cult of the dead and memory are reflected in high literary and human styling, incorporating the concept of the quest for Virtue as a spiritual necessity. The décor of the skylights, meanwhile, reflects the overtly human anger of a mother despairing over the death of her son, as shows in the allegories of despair accompanied by the famous motto “Plus d'espoir” (there is no more hope). Montal was largely unused by Jeanne de Balsac’s descendants and passed into the hands of the Pérusse d'Escars family in the late 16th century. In 1771, it was ultimately sold to the Plas de Tanes family, who lived a lavish lifestyle at the château for a number of years. Vestiges of their occupation include two Rococo-style fireplaces in the south-eastern tower. Montal was abandoned during the French Revolution and transformed into a farm. It then fell prey to speculators in the late 19th century. It was stripped of its sculptures, skylights, ornate doors and fireplaces, and was left in a terrible state of dilapidation. The property was given a new lease of life by Maurice Fenaille, a wealthy and erudite industrialist and one of the leading patrons of French museums between 1880 and 1930. Fenaille purchased the château in 1908 and spent five years restoring it to an exemplary standard. He collected the original statues from across the globe, and commissioned copies of those pieces that could not be recovered from artists working for his friend, Auguste Rodin. On September 13th, 1913, French President Raymond Poincaré held an official reception at Montal to mark the donation of the monument and its collections of artworks by Maurice Fenaille to the French state several months earlier.